Just one of many images of the apocalypse. Postapocalyptic fiction is pretty big at the moment. And by ‘pretty big’ I mean among the best-selling books and movies out there in the form of The Hunger Games. Of course there’s grittier stuff as well, scavengers looking to get by in the devastated future of Mad Max or prepper fiction. Harry Manners, author of the postapocalyptic Ruin Saga, made a good point about this when he said on Twitter that postapocalyptic fiction is a great arena to discuss the underlying fragility of civilisation. In a world where we have become so detached from the basics of survival, it can be terrifying to consider how easily our comfortable lives could be undermined. Postapocalyptic fiction is a way of addressing that terror, of venting and exploring modern fears. Perhaps it also lets us get a taste of the barbaric, as we increasingly come to understand that the rest of the world isn’t populated by backwards primitives, as everyone from the Romans to the Victorians believed. I find it fascinating that we can see the same themes – the fragility of civilisation, difficult choices between morals and pragmatism – in stories about the rise of civilisation. Rome and Deadwood both brought this to our TV screens, deliberately exploring how civilisation emerges while showing that as a difficult struggle of faltering steps. In both, the path to safety and security was spattered with blood, and the survival of something that might be called civilised always seemed under threat. As writers, it gives us two ways to explore these themes – with the birth and the death of civilisations. And as readers it provides something familiar and intriguing in wildly different settings. What do you think? What’s the appeal of postapocalyptic fiction? Are we really so fascinated by civilisation’s rise and fall? And if you want to see me grapple some more with what it means to be civilised, you can download my novella Guns and Guano for free from Amazon or Smashwords. This week’s Writing Excuses was about conveying world-building information without resorting to infodumps. Intrusive explanations are one of my pet writing hates, so it was good to hear these professional writers’ tips on how to get it right. I’m going to try out a piece of sci-fi tech. It’s not exactly a new idea, but it’s one I’m planning on using in a story soon, so it’ll make a good warmup. A twinge ran through Casey’s cheek, putting her immediately on edge. There were only two things that could have caused it. Discounting nervous ticks, to which she had never been prone, there was only one. Another twinge, and then another. A woman passing her on the pavement gave her a curious look but kept on walking. Putting her hand to her face, Casey felt the fake flesh of the mask sagging beneath her fingers. Trying to remain calm, to avoid drawing attention and blowing her cover, she ducked into a café, hand still pressed to her face, and hurried to the bathroom at the back. Bolting the door behind her, she stared into the mirror above the sink. The left side of her face was still fine, showing the features of the anonymous government clerk she had been imitating for the past month. But on the right side, vat-grown muscles were sliding away, revealing their wire frame and, worse yet, parts of her own face. Hastily, she took the slim control box from her pocket, almost dislodging the wire concealed along her neck. She hit the reset button and the left side of her face reverted to the mask’s blank-faced factory default. But the right remaining a lumpy, fallen mess. I didn’t feel like this exercise pushed me much. Because of what I write, and because I hate infodumps, I tend to write this sort of thing a lot. Of course that doesn’t mean I do it well, so let me know, how was that short scene? And if you’ve had a go at this exercise, how did you get on? 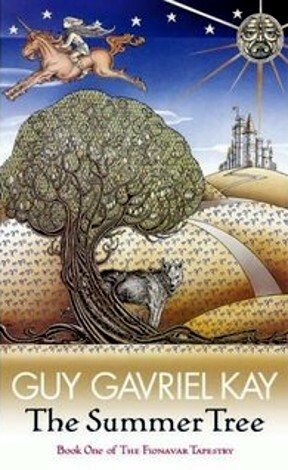 In talking about Guy Gavriel Kay’s The Summer Tree I mentioned the use of arts within the book. It’s an area I find fascinating. The role of art in society and its power to stir emotions are often overlooked in fantasy fiction. What makes it so useful? For me, there are two obvious points. Firstly, showing a society’s culture adds depth. It shows that there is more to people’s lives than the struggles they currently face, the wars and intrigues that are the backbone of so many plots. Secondly, it helps us connect to the characters. We all know what it feels like to be stirred by art that touches something within us. For me, that can be listening to Jeff Buckley’s Lover You Should Have Come Over, watching Lost in Translation or reading Fitzgerald’s The Great Gatsby. You’ll have your own examples, because while the feeling is universal, it’s triggers are seldom the same. So who else makes good use of culture in their writing? Tolkien uses songs and poems to explore the past. Iain M Banks has games in The Player of Games. John Scalzi’s Redshirts, while taking a different angle, at least shows TV as a prominent part of life. Who else is there? 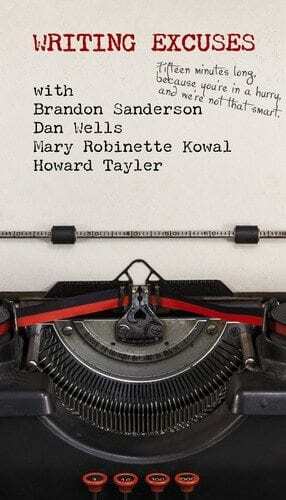 Which writers do this, and especially do it well? And what are the cultural experiences that really stir you? Share your thoughts in the comments. I’ve mentioned a couple of my favourite things, and I’d love to hear about yours. The thermostat in the quarantine room was broken, telling Dan that it was at room temperature when he could feel himself breaking out in a sweat. He’d already shrugged off the spacesuit and sat on a metal cot in shorts and a t-shirt, waiting for someone to tell him what was wrong. At last Jean appeared at the observation window, looking every inch the doctor in her white coat, a coffee mug in her hand. The mug exploded in her hand as she let out a cry of pain. Hand pressed against the glass, looking at him with a strange longing, and then slid to the ground. But there was no answer. 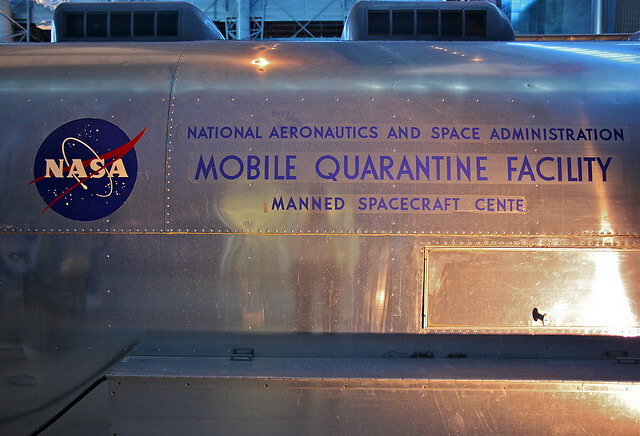 The quarantine room was sound proof, and without someone standing outside the intercom would have switched off. Jean needed his help. And he needed to see that she was OK, to hold her, to feel her warm flesh. The tension of the moment was muddling his thoughts, but he could find a way out. He flung himself against the window and then the door, trying to break through, all the while shouting for help. But there was no response, and the door and window held. A technician appeared on the other side of the glass. “Thank God!” Dan’s relief turned sour as he saw that this man too was hunched over in pain, his grey overalls drenched with sweat. He stumbled to where Jean lay, then crumpled over over beside her. “Dammit!” Dan was scared for himself as well as Jean. What if everyone in the base was infected? Would he be forgotten, left to starve in the quarantine cell, while Jean died inches away from him? His heart was pounding, his whole body quivering with tension. Desperate, he looked around for something he could use, but there was only a toilet and the cot bolted down in the corner of the room. The cot would have to do. He grabbed the aluminium bedframe, cold and hard beneath his hands. He’d expected it to be attached securely to the floor, but it came up surprisingly easily, metal screaming and screws popping as he wrenched it free. Then he ran at the window and swung the frame with all his strength, ready to batter the reinforced glass into submission. It shattered with one single, explosive blow. Leaping through the gap, he saw Jean and the technician on the floor. He could even smell them, an unexpected moment after so long alone. 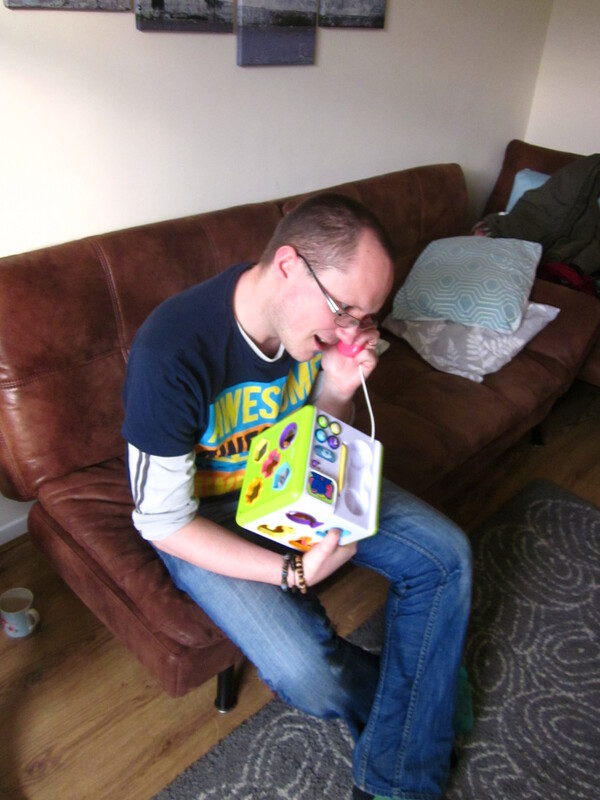 The technician hadn’t collapsed as Dan had thought. The man was crouched beside Jean, blood on his lips as he chewed her arm. In a rage, Dan grabbed the man and flung him aside. He hit the wall so hard that his head smashed open. The scent of blood was overpowering. Blood and something else. Was that brains? Could Dan really smell brains? He looked down at Jean, faintly aware that she needed help. But he was hungry, painfully hungry, a sensation he couldn’t even resist. And the technician’s brains smelled so very good. This story was inspired by an episode of PBS Space Time, which was just too good a concept not to use. If you liked this story then please share it. And you can read more of my science fiction in my anthology Lies We Will Tell Ourselves, available as an ebook through Amazon. Outside the world of geek, anti-immigrant party UKIP have risen to prominence in this year’s British general election. It’s no great revelation to say that an anti-immigrant party is reactionary and playing on people’s fears. I find all of this distressing, especially given the way that it has impinged upon what I normally consider a safe space, the welcoming a varied world of geek culture. And I find it hard to balance my own emotional reactions. On the one hand, I understand that change is frightening, that many of the reactionaries respond this way because they feel threatened. I feel sorry for their hurt and for the way that they aren’t able to embrace all this wonderful variety. But in understanding them and trying not to become reactionary against the reactions, I risk undervaluing my own feelings on the subject. They’re attacking things I value, they create an unpleasant atmosphere, and it’s not unreasonable for me and others like me to feel hurt by that, even a little frightened at where this is going. I remain hopeful. I’ve always been something of an opportunistic humanist, and the history of humanity, as well as that of the culture I love, to me shows an upward trend toward great diversity and understanding. But there are downward moments as well as upward ones, both becoming ever shorter and more frequent as humanity grows and change accelerates. For the sake of my sanity, I’ll lean into the hurt as well as the hope, use it to power my own work, and remember that this too will pass. Whatever the outcome of the Hugos, the general election, and a series of nasty Twitter spats, the diverse and joyful things I love aren’t going away. The ranting of sad and angry reactionaries will never stop that. Posted: April 25, 2015 in enthusing! One day, maybe we can all fart our way to the moon. Steampunk is a curious and often inconsistent thing, particularly when it’s the steampunk of Lavie Tidhar. I worked my way with interest through the oddity that was The Bookman. I read its sequel Camera Obscura with great excitement. And so at last I came to the final volume, The Great Game, eager to find out whether it would live up to its title. 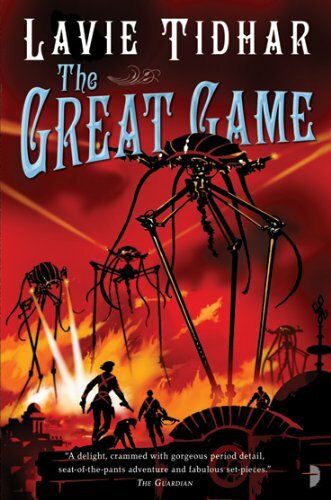 The Great Game is a story of spycraft and intrigue set in Tidhar’s Bookman world, a 19th century alternate history with lizard monarchs, alien devices and literary characters roaming the streets. That name – the Bookman – draws attention to the sort of characters we’re dealing with here – literary borrowings such as Mycroft Holmes and Victor Frankenstein, as well as archetypes such as The Bookman‘s Orphan and this volume’s retired secret agent Smith. Despite their well worn familiarity, those characters are one of the absolute highlights of this book. In particular, the reluctantly re-activated Smith and current agent Lucy are vivid, well depicted characters who I found good company and excellent drivers for their strands of the story. They’re clever and determined, pressing on through the confusion and overwhelming odds of their circumstances. Though Camera Obscura‘s Milady remains my favourite protagonist from this series, these are good, and certainly better than Orphan, who as Dial H for Houston pointed out, suffered from passivity and dullness. Smith and Lucy’s paths, and those of the other characters, take them through a journey that’s one part John le Carré tension, one part Bond-style action, and one part batshit crazy. That weird and wonderful world is a big part of the appeal of this series, and it plays off here in spectacular style. The spies are doubly spy-like, the crazy ten times what it was, creating a sense that both the characters and the story could be overwhelmed at any moment. Therein lies both the beauty and the problem of this book. I know others have found this plot chaotic, though I thought it cleverly intertwined rather than rambling like the first book. But it definitely lacks coherence in places, most critically the ending. Without giving the great game away, I felt that the ending lacked the sort of closure a thousand page series left me wanting, while not giving me enough to instead ponder the possibilities of what would come next. Look at the book’s cover, the version I’ve used in this post. Isn’t it bold? Isn’t it dynamic? Doesn’t it fill you with a desire for retro, pulpy, genre-mashing action? That’s what I wanted, even expected at first, from these books, and it’s an expectation they didn’t deliver on. They’re fascinating but flawed, far stronger in their ideas than their narrative cohesion, the bit players often more intriguing than the protagonists. I’m glad I read this series, and that I saw it through to the end. These are good books. I’d even go so far as to call Camera Obscura great. But they don’t deliver on what they seem to promise, and that, for me, was their downfall. For me as a writer, it’s also a very important lesson. Make sure your book does what it promises to, or you’ll have some disappointed readers.